Ram Nation Volunteers have always been ready to lend a helping hand to those in need. Recently, a group of Ram Nation Volunteers headed to Flint Michigan to help deliver needed drinking water. The attention of Ram Nation now turns south to help Texas deal with flooding that occurred over the recent Memorial Day weekend. 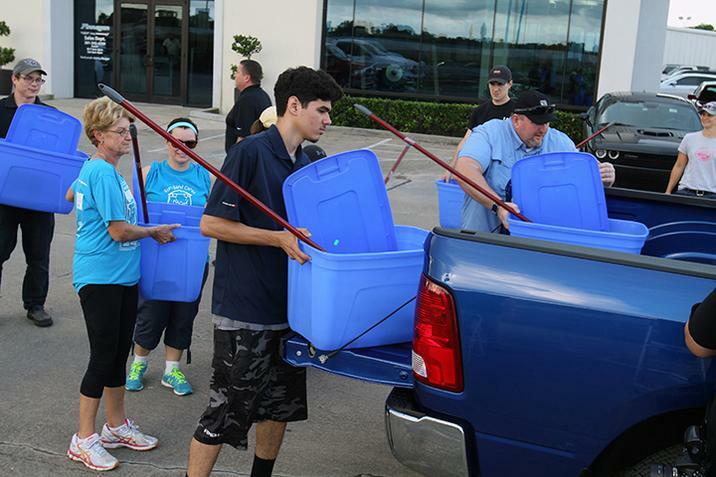 Ram Nation Volunteers from local dealerships and the Ram Truck brand’s Southwest Business Center teamed up with the First Response Team of America over the weekend to help those in Rosenberg, Texas with the flooding that occurred there. They delivered supplies and helped clean up homes that were damaged. Ram brand has been helping with the First Response Team of America since they formed a partnership with them in 2012. In that time, they’ve donated more than $300,000 to the group and have had numerous operations across the US in areas hit by natural disasters. Ram Nation was a group formed in 2012 by those that loved the Ram brand and wanted to use their trucks to help out those in need. Ram Nation consists of volunteers with trucks to dealership employees. If you want to find out more about Ram Nation and would like to find out how to join, visit here. This entry was posted in Queens Bayside Chrysler Jeep Dodge, Ram, Ram News and tagged aid, Bayside Chrysler Jeep Dodge, First Response Team of America, Ram, Ram Nation, rosenberg, Texas, volunteer work by baysideadmin. Bookmark the permalink.